Wood's book ‘Jock Scott’ goes into great detail on the subject. Now we take a 'floating line' for granted, but until the 1960s manufacturers had not developed the line technology to produce self-efficient lines that 'float', 'slowsink', or 'fastsink' at a variety of speeds. Wood's lines were of silk Kingfisher: he greased these lines with lanolin 2 or 3 times a day. Leaders were almost certainly from gut, tied to the fly with his Cairnton knot. He fished a single-handed 12ft rod, but still cast his fly a prodigious distance. While he probably cast at 45° to the bank, he also wrote in a letter to Farlows, of Pall Mall, to the effect that "I cast upstream so that the fly drifts downstream like a leaf". Wood's personal fishing diaries, now held by his grand-daughter, record his exploits from the time when his fishing consisted of occasional weeks at Ballynahinch in Ireland, and at Cairnton, until his death in 1934. 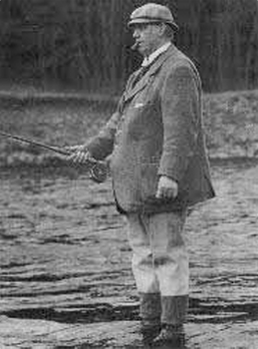 Cairnton provided the setting for most of his fishing from 1918; he took an annual lease of Cairnton from then until his death. The water was owned by the Burnetts of Crathes, and contained a rather small Cottage, with modest bankside accommodation. Wood stayed at Glassel while the Cottage was razed and a Mansion built in 1921; he added 2 excellent lunch huts, and 2 rain shelters on the banks. The Mansion comprised 3 suites with bath, 2 single rooms with bath, ample reception area, and a staff flat for the female servants with a separate annexe for the men!!. Later he devised a system whereby from his study he knew the water height; the drawings and parts of this system survive. It surprises his descendants that he did not develop a system to tell him the water temperature on which his fishing most depended. By possibly apocryphal reports, Wood was a stickler for effort; but had lunch delivered to the 2 huts by the chef and chauffeur: He kept a record of the times of day when fish were caught; though the obvious conclusions can be drawn, there was no slacking of effort around lunch-time. Indeed, this analysis shows little bias in favour of morning, afternoon, or evening to the pattern we see today. Even by todays standards, the engineering design that was used to erect the lunch huts was superlative and can be matched in his design of the 'Rodroom'; here he provided racks and reels for drying lines, for both left- and right-handed tackle; a cool room for cleaning fish in preparation for marketing after weighing and measuring - he kept a skin-scale from almost every fish for 'dating'. His dislike of wading led him to design and set up jetties to help in reaching the lies; modern man needs the help of JCBs to replace the stones that have been displaced over time. How he managed, we can only guess, but like the Pharoes, he managed without. In his search for the perfect fly, Wood used only a 'March brown' for a whole year, and a 'Blue Charm' for another, to find the best pattern; his success with either was hardly different, but he went for the Blue Charm with a little help from the Jock Scott and the March Brown, and the Silver Blue in high or very clear waters. This search for facts led him to record for each day his 'contacts', classified as 'Caught', 'Kelts', 'Lost', 'Pulled', or 'Rises'; as often as not, the contacts added up to 20 incidents a day. Oh that we could claim the same activity over recent years: The Dee was full of fish in his day, and one can only imagine what today's fisher, with today's equipment, and Wood's skill might have achieved. His death in 1934 saw the end of an era: The estate reverted to the Burnetts.